OM in the News: Will Robots Will Soon Rule the Warehouse? Tracking the progress of the today’s orders at Southern Glazer’s. Right in the center of Florida, in the city of Lakeland, lay some of the most technologically sophisticated distribution centers in the country, writes The Wall Street Journal (Feb. 9-10, 2019). You’ll find operations from Amazon, DHL (for Ikea), Walmart , Rooms to Go, Medline and Publix, along with a huge Geico call center, the world’s largest liquor distribution warehouse, and numerous local factories. Some experts are arguing that the economic good times for Lakeland could rapidly come to an end. Brookings Institution placed it third on its list of metros that are most at risk of losing jobs because of the very same automation and A.I. that make its factories, warehouses and offices so productive. 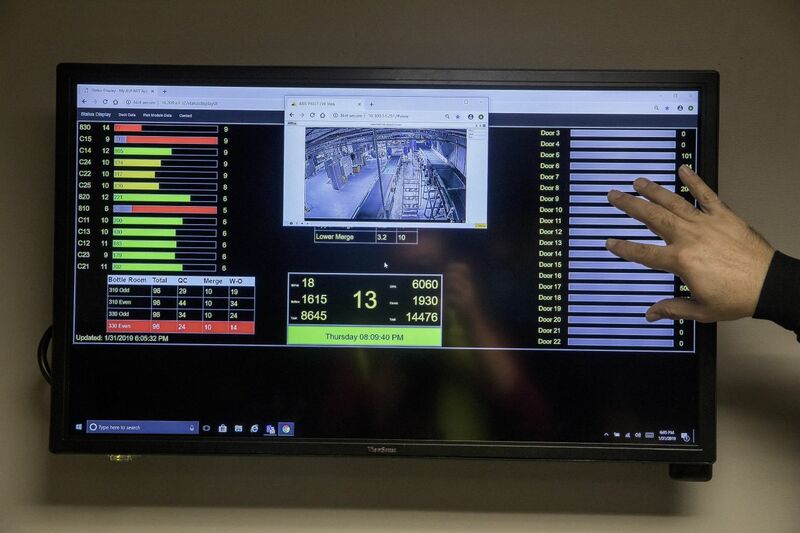 To understand what’s going on in Lakeland, we look at Southern Glazer’s Wine & Spirits, the world’s biggest alcoholic-beverage distributor, and its highly automated 1.3-million-square-foot facility which ships out 85,000-90,000 cases/day. Like many other distributors in the area, Southern Glazer’s chose Lakeland because land is cheap, highways are readily accessible and wages are low. The facility employs 368 warehouse workers. As in automated warehouses the world over, humans do only the jobs that machines can’t—either knowledge work like managing the overall system or physical tasks that require a combination of delicacy, speed and visual acuity. All of the heavy lifting—from placing 2,500-pound pallets into 5-story shelving systems to conveying individual crates throughout the warehouse—is done by machines. In many ways, the Lakeland warehouse represents a triumph of engineering. Ten years ago, Southern Glazer’s operated 5 warehouses in Florida. It consolidated them all into one thanks to automation–which meant layoffs of almost 20% of the workforce. With automation, though, workers use their brains more, managing the flow of goods through systems and adapting them as consumer demand changes. This has led to much lower turnover. Over the long run, there’s no evidence that automation reduces the number of jobs. Indeed, countries that automate the fastest appear to also grow their economies the fastest. Will we soon see a “light’s out” warehouse? What functions are hard to automate at a distribution center?